I received an error page that says ‘Oops’ with a picture of a dog. What does this mean? 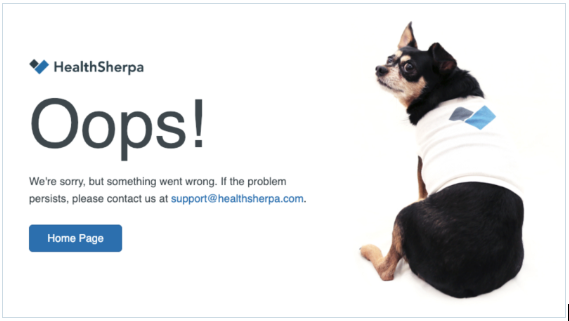 If you see an ‘Oops’ page or a red banner, this is due to a technical issue at HealthSherpa and/or Healthcare.gov. To help us identify the issue, please reach out to agent_support@healthsherpa.com with your name and NPN, the applicant’s first and last name, and any details that may help us resolve the issue (such as the steps you were taking that led you to this page). For the fastest response, you can call us at 888-684-1373 during our regular business hours.